Dell Wyse 5040 All-in-One Thin Client w/ 21.5-Inch Display AMD G-Series T48E 1.40GHz Dual-core (2 Core) Processor 2GB DDR3 SDRAM Memory 8GB Flash Drive and Wyse Thin OS 8.1 OS. Please Note, This Is Not A Regular Windows PC But A Thin Client Desktop Made To Work On Certain Networks! Please note, these units may have minor scuffs and / or scratches on plastic body, but the LCD Screen itself is in excellent cosmetic condition with no scratches! Do not include any other accessories. Dell Wyse 5040 All-in-One Thin Client with 21.5-Inch Display, AMD G-Series T48E 1.40 GHz Dual-core (2 Core) Processor, 2GB DDR3 SDRAM Memory, 8GB Flash Drive and Wyse Thin OS 8.1 OS. Dell Part Number: N4XFG RHTPC. Increase security and make desktop management easy with a virus- and malware-resistant all-in-one thin client featuring Wyse ThinOS and a 21.5 display. 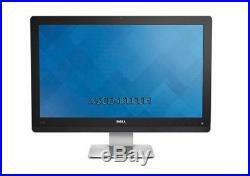 Dell Part Number: N4XFG 0N4XFG CN-0N4XFG Compatible Part Numbers: RHTPC 0RHTPC CN-0RHTPC. Security and virus resistance An integrated solution that combines the security and easy management of traditional thin clients with the power and performance to deliver high-end graphics and HD multimedia, the Wyse 5000 series is the first all-in-one (AIO) thin client to operate on the ultra-fast, virus-resistant ThinOS. With an unpublished API and encoded with AES disk encryption combined with the power of an AMD G-Series dual core 1.4GHz processor, the 5000 series AIO boots in less than 10 seconds and supports users most demanding audio and video workloads for Citrix, Microsoft®, VMware and Dell vWorkspace virtual desktop environments. Effortless management and scalability A simple one-cord design and out-of-box automatic setup makes deployment effortless. Save valuable IT resources and increase ROI with a thin client that doesnt need any on-site management or configuration. The device can also be managed remotely with a simple file server, Wyse Device Manager (WDM), or Wyse Cloud Client Manager to help lower the total cost of ownership and offer enterprise-wide management that scales as you grow from just a few thin clients to tens of thousands. Wyse 5212 Aio-Versatile, streamlined design Versatile, streamlined design This sleek, thin all-in-one wont clutter users desks, and the elegant design perfectly complements any customer-facing or business space. Flexible multimedia connectivity The Wyse 5000 series AIO offers versatile connectivity options for use in a wide range of industries. With four USB 2.0 ports and Gigabit Ethernet, users can link to their peripherals and quickly connect to the network while working with processing-intensive, graphics-rich applications. Unified Communication Lync 2010, Lync 2013 and the Skype for Business client for Lync 2015 (UI mode) via the Citrix HDX RealTime Optimization Pack, built-in speakers, a camera and a microphone make video conferencing and desktop communication simple and easy. It even supports a second attached display for those who need a dual monitor configuration. Environmentally conscious for long-term value Designed for cost-effective virtual desktop deployments, this AIO thin client delivers great value from day one with minimal initial investment and power-efficient operation. Additionally, Dell practices environmentally aware design with an ISO 14001-based environmental management system and WEEE recycling processes. All Wyse products meet stringent RoHS requirements and EPEAT compliance. Versatile applications The 5000 series AIO thin client combines affordability with extremely secure desktop virtualization to increase workplace productivity and aesthetics. Healthcare, Finance and Retail Secure, virus-resistant all-in-one for hospitals, nurses desks, clinics, call centers, traders, banks and retail point-of-sale Multi-monitor capability for power users and small form factor for use with mobile computing carts Education Cost-effective, high performance all-in-one for classrooms, libraries and labs Integrated webcam and speakers for multimedia purposes Work from Home Easy deployment and remote management with total data security for remote employees Affordable, compact all-in-one for at-home productivity Specifications. Wyse 5040 AIO Thin Client. AMD G-Series T48E Dual Core 1.4GHz. 8GB Flash, 2GB RAM DDR3. 4x USB 2.0 ports 1x RJ45 1x SFP fiber (optional) 1x VGA (PC mode) 1x DisplayPort (dual display) Composite audio jack: 1/8-inch mini, 16-bit stereo / Internal mono speaker HD web cam (integrated) Speaker bar (integrated) Microphone (integrated). Display with stand (W x D x H): 531mm (20.9 in) x 181mm (7.1 in) x 408mm (16.0 in) Display without stand (W x D x H): 531mm (20.9 in) x 45mm (1.8 in) x 343mm (13.5 in) Fixed Stand (W x D x H): 191mm (7.5 in) x 181 mm (7.1 in) x 315mm (12.4 in). Wyse ThinOS 8.1 with PCoIP. Wyse 5040 AIO Thin Client - Stand - Power Adapter. The advertisement of any product does not constitute an offer to sell. Your order does not signify our acceptance of your order, nor does it constitute confirmation of our offer to sell. We reserve the right to accept or decline your order. Ambiguity: In the event that something may seem ambiguous to you or you think we made a typo or a mistake. This agreement shall be construed under and in accordance with the laws of the state of Ohio, and all obligations of the Parties created in this Agreement are performable in Lake County, Ohio, United States of America. Powered by SixBit's eCommerce Solution. The item "DELL WYSE 5040 AIO 21.5 THIN CLIENT AMD G-T48E THINOS8.1 ALL-IN-ONE N4XFG RHTPC" is in sale since Wednesday, November 14, 2018. This item is in the category "Computers/Tablets & Networking\Enterprise Networking, Servers\Servers, Clients & Terminals\Thin Clients". The seller is "ascendtech" and is located in Cleveland, Ohio. This item can be shipped to United States, Canada, United Kingdom, Denmark, Romania, Slovakia, Bulgaria, Czech republic, Finland, Hungary, Latvia, Lithuania, Malta, Estonia, Australia, Greece, Portugal, Cyprus, Slovenia, Japan, China, Sweden, South Korea, Indonesia, Taiwan, Belgium, France, Hong Kong, Ireland, Netherlands, Poland, Spain, Italy, Germany, Austria, Israel, New Zealand, Philippines, Singapore, Switzerland, Norway, Saudi arabia, Ukraine, United arab emirates, Qatar, Kuwait, Bahrain, Croatia, Malaysia, Chile, Colombia, Costa rica, Dominican republic, Panama, Trinidad and tobago, Guatemala, El salvador, Honduras, Jamaica.